The elite Republican Guard is one of the main actors on the government side in the Syrian civil war that set up auxiliary formations. Prominent examples include the Popular Defense Forces (Quwat al-Difa' al-Sha'abi) primarily based in the Qalamoun area near the border with Lebanon and Liwa Sayf al-Haq, whose base is in the Sayyida Zainab area but has operated in the Qalamoun area. The Republican Guard has also aimed to extend its reach into towns where it might compete with other formations for influence, such as the 'reconciled' Damascus countryside town of al-Tal. Fawj al-Karbala'i (The Karbala'i Regiment), named for its leader who goes by the name of al-Hajj Abu Ali al-Karbala'i, is a group that has most recently come under the Republican Guard umbrella of 'Ittihad Jaysh al-Asha'ir (Union of the Army of the Tribes). It should be noted that a Jaysh al-Asha'ir (Army of the Tribes) was also set up by the Republican Guard for the southern province of Dera'a in December 2017. According to a source from Fawj al-Karbala'i, the group was established in 2014. Its engagements have so far included the areas of Aleppo, Damascus, Homs and Deir az-Zor. Although the name of al-Karbala'i (of Karbala', the Shi'i holy city in Iraq) may be taken to suggest that the group's leader is from Iraq, he is in fact Syrian. 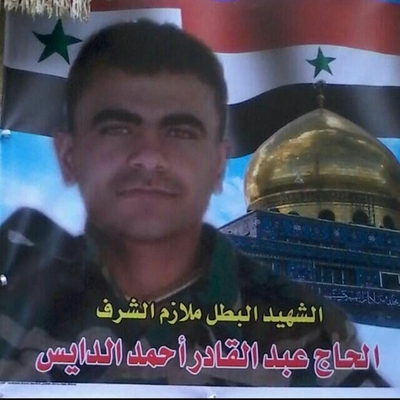 Based on the name he has assumed and various photos of him, he is likely Syrian Shi'i. Prior to the existence of a meaningful profile of Fawj al-Karbala'i on social media, some references to the group turn up on pro-government pages that feature posts alleging corruption and criminal behavior. One of the figures these posts focus on is Wahib Saqr, a Syrian army general originally from Jableh who was killed fighting the Islamic State in east Aleppo countryside and earned the nickname 'Saqr Halab' (Hawk of Aleppo) for his role in the fighting there. 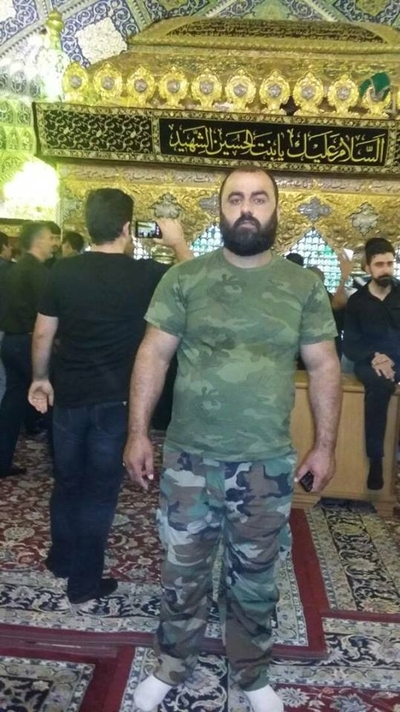 Abu Ali al-Karbala'i at the Sayyida Ruqayya shrine in Damascus. One of these posts from January 2017, for example, denounces Wahib Saqr as the "hero of fictional battles...and the king of plundering and acts of theft," alleging that he engaged in such actions in Aleppo, Khan al-'Assal (west Aleppo countryside) and Deir az-Zor. The post mentions his alleged "dealing in sugar, cigarettes, rice and flour," which appears to refer to the war profiteering that developed out of the extended Islamic State siege of government-held areas of Deir az-Zor. These actions are said to have been carried out to the detriment of the "heroes of the air college" in Aleppo who "have been continuing day and night in working on strengthening the lines of defense with the minimum means and available individual weapons." For context, "the air college" refers to the area of Kweiris airbase to the east of Aleppo city, about which more below. Among the alleged thieves working for Wahib Saqr, the post alleges, is the "leader of a so-called group, al-Hajj Abu Ali al-Karbala'i, the one called Abu Firas (Muhammad al-Meqdad): for he and his group are responsible for cutting up olive trees and stealing the property of citizens in the villages that have been liberated." A similar post from December 2016 calls him Abu Firas al-Der'awi (suggesting he is originally from Dera'a), describing him as "leader of the al-Karbala'i group, and it is a group comprising many thieves...and the greatest calamity is that this group is located within the points of protecting Kweiris military airbase," which was besieged by the Islamic State until November 2015, when Syrian government forces backed by Iranian and Russian allies broke the siege. Wahib Saqr is said to have been one of the leaders of the campaign to break the siege, meeting his son Ala' who had been among the besieged personnel in the airbase. However, operations after breaking the siege were primarily confined to protecting the periphery of the airbase, as the focus shifted to retaking Aleppo city in its entirety. Once that had been completed by December 2016, attention turned towards recapturing the remaining eastern Aleppo countryside from the declining Islamic State, partly aiming to block further advances by the Turkish-backed 'Euphrates Shield' group of rebels. In relation to the campaign pushing into the eastern Aleppo countryside, a post from February 2017 mentions acts of plundering by some groups linked to Wahib Saqr and other groups claiming affiliation with Suhail al-Hasan's Tiger Forces. Among the former is the "al-Karbala'i group led by a person from Dera'a, a traitor to the homeland." The result of the plundering is that "people have begun raising their hands and saying: if only they had not been liberated" in reference to the countryside areas east of Aleppo. 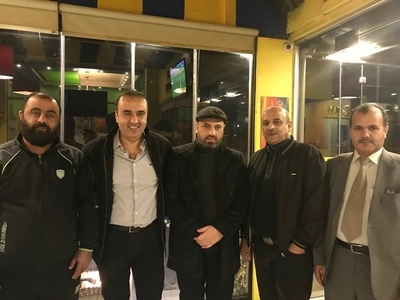 It is difficult to come by information on Wahib Saqr's involvement in operations prior to the Aleppo theatre in 2015-2017, where it appears he was particularly close to the Arab Nationalist Guard. While Fawj al-Karbala'i's deployment to the periphery of Kweiris airbase is corroborated, the source from Fawj al-Karbala'i denied that Abu Ali al-Karbala'i is from Dera'a. Rather, he is a doctor from Homs. The source also affirmed that Fawj al-Karbala'i had been working with the Republican Guard from the outset of its formation. From one post, it is evident that Fawj al-Karbala'i has been linked with the Popular Defence Forces. 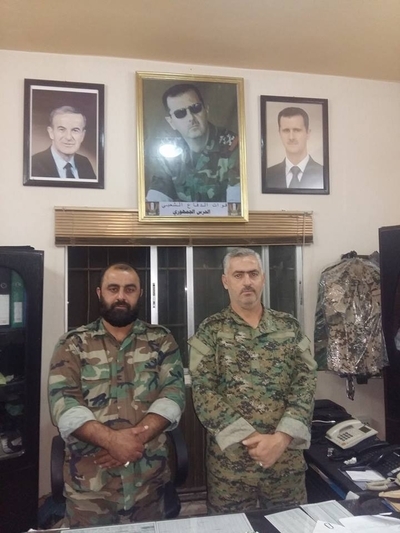 Abu Ali al-Karbala'i (left) with Tayseer Khalil (right), leader of the Popular Defence Forces. 'Ittihad Jaysh al-Asha'ir was formed in October 2017. Under Republican Guard leadership, the conglomeration most notably includes Fawj al-Karbala'i and a group led by Sheikh Tamam al-Tarkawi, who appears to have been involved with air intelligence. Posts on the establishment of 'Ittihad Jaysh al-Asha'ir also mention a leadership role for one al-Hajj Khalid (Abu Hussein), who is better known as the leader of the Islamic Revolutionary Guard Corps-linked group called Liwa al-Baqir. Included as part of these posts are photos that include Abu Ali al-Karbala'i and al-Hajj Khalid as well as Jum'a al-Ahmad, another prominent figure in Liwa al-Baqir. All that said, the source from Fawj al-Karbala'i said that "al-Baqir has no relation with Jaysh al-Asha'ir," presumably referring to Liwa al-Baqir as a formation. al-Hajj Khalid (third from left) and Abu Ali al-Karbala'i (fourth from left). Jum'a al-Ahmad on furthest right. One of the photos put out as part of the announcement of 'Ittihad Jaysh al-Asha'ir. 'Ittihad Jaysh al-Asha'ir offers a monthly salary of 50,000 Syrian pounds, with recruitment open for people from ages 18-42, including those wanted for military and reserve service and those who evaded the draft or deserted, for whom there is the possibility of taswiyat al-wad' if they have not committed a crime of murder. 'Ittihad Jaysh al-Asha'ir does not accept military personnel on active duty. The schedule operates according to 15 days of work and 15 days of rest each month.The group's base is in Damascus at Governorate Square. al-Hajj Abd al-Qadir Ahmad al-Dais, a 'martyr' of Fawj al-Karbala'i. Note the Sayyida Zainab shrine depicted in the background. Since its inception, 'Ittihad Jaysh al-Asha'ir's most notable campaign has been in the eastern region, including the Albukamal area. At the present time though, focus has shifted towards the Hama-Idlib front where intense fighting is taking place, reflecting a wider withdrawal of forces (including foreign militias) that participated in the campaign to retake the eastern regions from the Islamic State. Indeed, there has been an extensive mobilization of forces for the Hama and Idlib countryside campaigns. Meanwhile, the Syrian army and local militias seeking new recruits have mostly been left to hold ground in Deir az-Zor, with a small Hezbollah presence remaining as well. 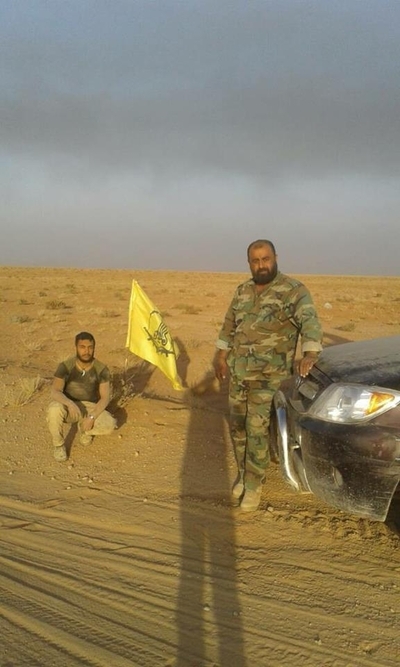 Abu Ali al-Karbala'i (right) in Deir az-Zor. 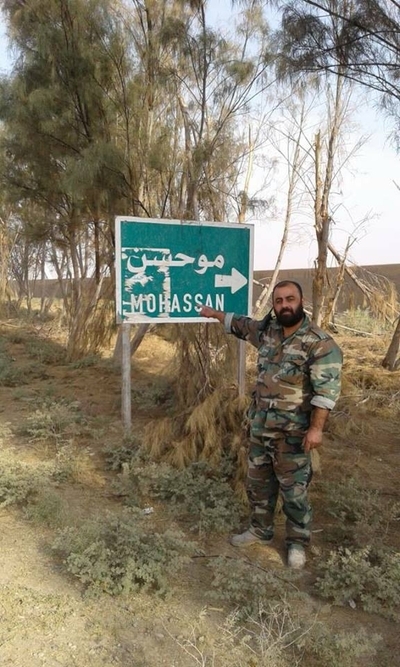 Abu Ali al-Karbala'i in front of a sign pointing towards Mohassan in Deir az-Zor. The turn of many forces back towards the west has created problems as the Islamic State has not fully lost territorial control in the province. As the leader of Liwa al-Imam Zain al-Abidin who is currently in Deir az-Zor put it to me: "In the Albukamal countryside, we have martyrs daily in the areas [we] control, especially after the withdrawal of the Nimr [Suhail al-Hassan] and his forces and the withdrawal of Liwa al-Quds who have headed towards Idlib...there is only a small number [of the allied forces: Hezbollah, Iraqi factions etc.]. Currently the goal is to preserve the areas the army has seized." As Hassan Hassan has argued, much of the eastern campaign on both sides (i.e. government and allies on one hand and Syrian Democratic Forces with U.S. coalition on the other) has focused on flag placing and claiming seizure of territory before proper control was asserted. The result is that we still have an active Islamic State insurgency in the border areas. By now there are multiple auxiliary formations that focus on recruitment of tribesmen, such as the Forces of the Fighters of the Tribes and the Sha'itat Brigade that are affiliated with the military intelligence. Fawj al-Nabi al-Akram, which originated in the Syrian Hezbollah Liwa al-Imam al-Mahdi and developed links with the 'Da'esh Hunters,' also featured tribal fighters among its 'martyrs' in the push towards the east. The group even took an alternative name of Kata'ib al-Hashd al-Asha'ir [al-Bakara] 313 (Battalions of the Mobilization of the Tribes: [al-Bakara] 313) in addition to the old name of Kata'ib al-Imam al-Ali. Indeed, the group's commander- Ayub Abd al-Sheikh, aka Abu Azzam- was killed in Deir az-Zor in autumn 2017. He was originally from the al-Zuhur neighborhood of al-Hasakah city, and had the nickname of 'Jaguar of the al-Bakara,' in reference to the al-Bakara tribe that dwells in al-Hasakah and Aleppo provinces (in the latter case forming the foundation of Liwa al-Baqir). 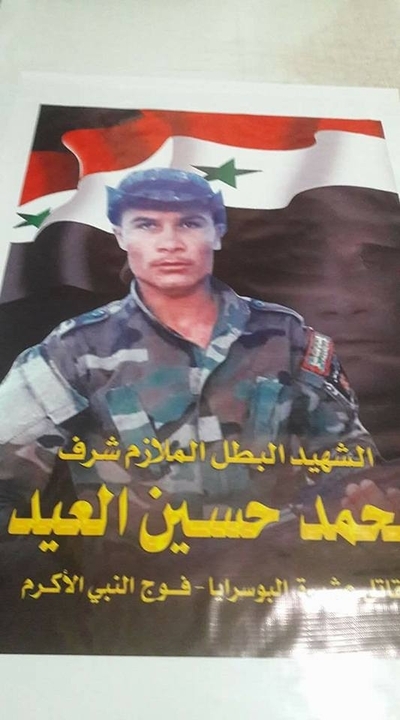 Muhammad Hussein al-Eid, identified as a fighter from the Albu Saraya tribe and reported to have been killed in August 2017 for Fawj al-Nabi al-Akram. In a similar vein, leader of Liwa al-Imam Zain al-Abidin tells me that in coordination with al-Hajj Azra'il of Lions of the Eternal Leader, he would like to set up an initiative called Quwat Abna' al-Furat (Forces of the Sons of the Euphrates), focusing on tribal recruitment. The initiative may end up being supported by Hezbollah or the military intelligence. 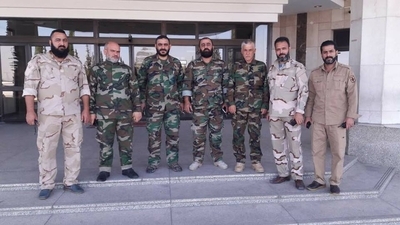 Abu Ali al-Karbala'i (furthest left) with Sheikh Aws al-Khafaji (centre), the leader of the Abu al-Fadl al-Abbas Forces. For his part, the source from Fawj al-Karbala'i says his group has recruited in particular from the tribes of the central and eastern regions of Syria. The concept of tribal dynamics does not of course play a central role in every part of Syria, but it is clear the government and its allies considers tribes to be potentially useful for creating local holding and offensive forces in areas of Syria where they matter.